Original Lindhaus bags come in package of 10 bags, plus 2 exhaust filters. 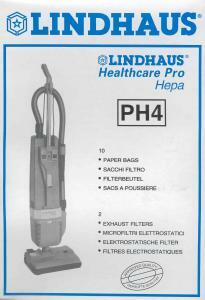 - Designed to fit all Lindhaus Healthcare Pro Hepa 12 and 14 inch, CH Pro, and RX Hepa models. Original Lindhaus bags come in package of 10 bags, plus 2 exhaust filters. Designed to fit all Lindhaus Healthcare Pro Hepa 12 and 14 inch, CH Pro, and RX Hepa models. Thanks for your courteous and timely help. The filters arrived today, on schedule. I will definately shop again with your store online!